It was Autumn of 2016 when singer/songwriter Marcella Detroit of Shakespeare’s Sister (“Stay”), Eric Clapton band member (co-writer of his mega-hit, “Lay Down Sally”) and her hubby, [director/actor] Lance Aston decided to move back into the thriving heart of Los Angeles. On her first day at the gym, she noticed on a screen, on the bike next to her, the pontificating countenance of then Presidential candidate, Donald Trump. Not being a fan, she was shaking her head in dismay when she was suddenly greeted by a woman who, with concern asked, “Are you ok?” She said “Yes, I just can’t stand the sight of him” to which the woman, replied, “I can’t either!!!”. Marcy soon discovered that the woman she was talking to was no stranger to show business: as an actress, she had appeared on “The Brady Bunch” as Greg Brady’s girlfriend; she turned out to be the daughter of Sherwood Schwartz, the famed creator of The Brady Bunch and Gilligan’s Island. She herself became a writer, winning awards for stage works, penning screenplays and musical scores, as well as having her own band. Plus, she happened to be married to one of the world’s most acclaimed guitarists, Grammy-winner, Laurence Juber, lead guitarist for Paul McCartney’s Wings, Al Stewart and many other notable artists. Hope Juber and Marcy struck up an instant friendship and, learning about each other’s careers, found that they had a lot in common. This initial bonding prompted them to write the song, “Overrated”, based on the demeaning term Trump would use to describe anyone who got under his skin. Laurence produced the track in their Studio City, California home studio, one very rainy afternoon on the weekend after the inauguration. He played all the guitars and bass, did the arrangement and had a good friend of theirs, Denise Fraser, (Sandra Bernhardt’s drummer and musical director) add drums. This began a "poli-rock" project that chronicles the bewildering state of the government of America and all of the unbelievable twists, turns, and catch phrases that have accompanied this 45th President’s administration. From Mar-a-Lago to Alternative Facts, this creative endeavor has provided an outlet for the frustration, rage and bewilderment so many of us have been feeling. If you relate to it, we get it, we are with you. If you don’t... then we live on different planets. 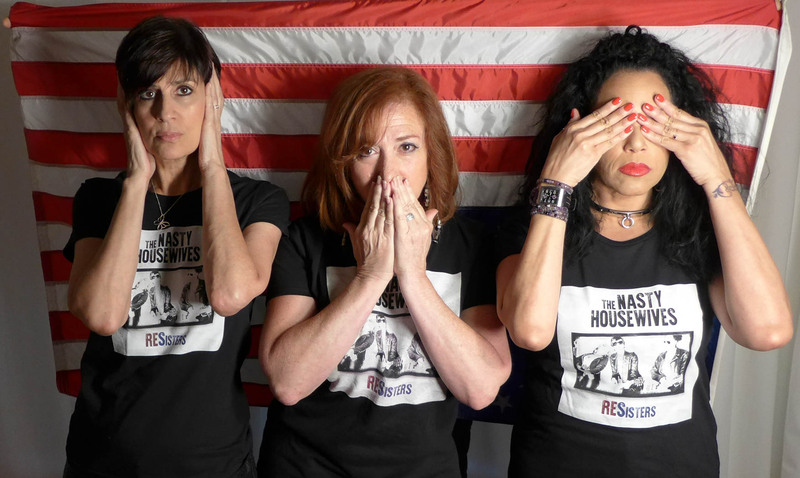 “The Nasty Housewives” band name is a spin on a well known LA area underground cult comedy-rock band from the ’80’s called “The Housewives” which was Hope’s brainchild. They appeared on many popular TV shows across the US including Oprah, Entertainment Tonight and were regulars on ABC's daytime The Home Show. The Housewives never truly went away. Now they are back and Nastier than ever!! !